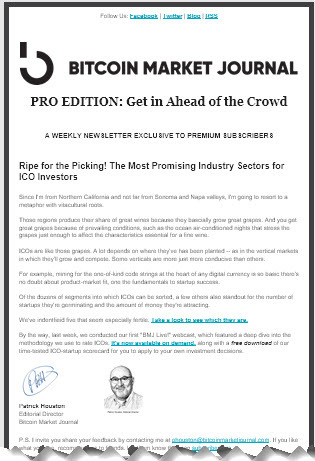 As consulting editorial director, I conceived, positioned, designed, wrote, and produced this weekly newsletter, aimed at pro cryptocurrency investors. Since I’m from Northern California and not far from Sonoma and Napa valleys, I’m going to resort to a metaphor with vitacultural roots. Those regions produce their share of great wines because they bascially grow great grapes. And you get great grapes because of prevailing conditions, such as the ocean air-conditioned nights that stress the grapes just enough to affect the characteristics essential for a fine wine. ICOs are like those grapes. A lot depends on where they’ve has been planted — as in the vertical markets in which they’ll grow and compete. Some verticals are more just more conducive than others. For example, mining for the one-of-kind code strings at the heart of any digital currency is so basic there’s no doubt about product-market fit, one the fundamentals to startup success. Of the dozens of segments into which ICOs can be sorted, a few others also standout for the number of startups they’re germinating and the amount of money they’re attracting. We’ve idenitfied five that seem especially fertile. Take a look to see which they are. By the way, last week, we conducted our first “BMJ Live!” webcast, which featured a deep dive into the methodology we use to rate ICOs. It’s now available on demand, along with a free download of our time-tested ICO-startup scorecard for you to apply to your own investment decisions.